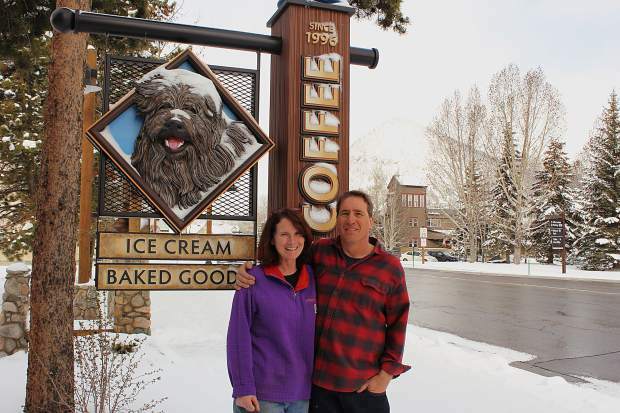 Suzie and Dave VerSchure moved to Summit County to open Abbey's Coffee in 1996. The pair spends their time skiing the mountains in winter and traveling the world in spring. Even for coffee shop owners, the first cup of joe in the morning is the best part of the day. Dave and Suzie VerSchure have owned Abbey’s Coffee in Frisco for the last 21 years. Aside from his daily shot of caffeine, Dave said the best thing about the shop is being his own boss. But for Suzie, it’s the people. The pair moved to Summit County from Boulder after Dave’s father expressed an interest in opening a coffee shop after he retired. The VerSchures opened the business two months after moving in 1996, naming it after their rescue dog, Abbey, who was around a year-and-a-half old at the time. “We weren’t going to name it after us. We love dogs. That’s our big passion. So she just seemed to be the natural choice,” Suzie said. The pair are avid animal lovers, with spots on the patio outside Abbey’s for customers to keep their dogs. Suzie has been on the board of League for Animals and People of the Summit since 1999. Although Abbey has since passed away, the couple continues to work with animals. They now have two rescues named Hugo and Ripley. Suzie said that one of the benefits of being in Summit is that the shelter here brings stray animals in from other areas, because Summit residents are so pet friendly. Suzie and Dave met in Steamboat Springs in the late ’80s. Suzie said that Dave was the first person she met that was from Colorado. The two, who were neighbors, bonded over a shared hobby — reading. “Her roommate said ‘Suzie, you’ve got to meet the boy next door, he reads books,’” said Dave. Dave reads tomes on history, while Suzie opts for fiction and books about travel, another passion. The VerSchures consider themselves to be mountain people. Dave was born in Aspen, and wanted to quickly return to the mountains after moving away from Steamboat in 1995. Suzie, on the other hand, grew up living around the globe with her family. Like most people in Summit, they enjoy skiing and being outside with their dogs in the snow. But a sense of wanderlust pulls the couple away for trips around the world. During the spring, when Summit is a little quieter, the couple tries to escape to Europe. Italy is their favorite destination. Since they primarily travel in spring, it’s too early for hiking in the Dolomites and too late for skiing. Instead, the pair usually drives around the country seeing the sites. The couple also enjoys diving as a warmer pastime. They have ventured off to Jamaica, Roatán in Honduras and Mexico to explore the depths of the ocean. The couple is hoping that their next diving trip will be over to Belize.